Editor’s Note: This is the third of a three part series debunking the economic myths of the 2012 Obama campaign. To read the first part, click here. To read the second part, click here. Staunch supporters of President Obama still blame the high unemployment rate on bipartisan opposition to Obama’s American Jobs Act proposal, believing it would have delivered everything the president claimed. The reason why Republican, Democratic and Independent lawmakers did not pass his plan was because it was evident the bill was more about tax hikes than job creation, did not pass the cost-benefit analysis test, and would not have put a dent in the unemployment rate. Regarding whether or not the $447 billion bill would have actually created 1.9 million jobs as Obama claimed, non-partisan Tax Foundation President Scott Hodge explained that the bill would have created “few, if any” jobs due to the fact that the bill offered short-term measures and was not built around long-term expectations. Bloomberg also surveyed 34 economists to gauge the impact of the AJA. Of those, 28 economists estimated how many jobs would be created by the bill. The median estimate was 275,000 jobs in 2012 and 13,000 jobs in 2013 for a total of 288,000 temporary jobs — far fewer than the nearly 2 million claimed by the president. That adds up to about $1.55 million worth of taxpayer money for every potential job it would create to lower the unemployment rate by 0.2% at best. The $831 billion American Recovery and Reinvestment Act of 2009, otherwise known as “the stimulus,” failed to deliver most of what Obama promised it would to get it passed. Today, more than 23 million working age Americans (18-64) are unemployed, underemployed, or have given up looking for work altogether. Unemployment stayed north of 8% for a record 43-month stretch and has certainly stayed north of 6% throughout 2012. It finally dipped below 8% in September due to more people giving up looking for work, temporary part-time hires and public sector growth. Third, Obama said in February 2009 that the stimulus would lift “2 million Americans from poverty.” But since Obama took office, 6.3 million Americans have fallen into poverty. 2010 U.S. Census data showed that 46.2 million Americans were living in poverty. Worse still, child poverty has increased, rising to 21.6%. Many middle class Americans, unable to find work or decent wages, have fallen below the poverty line in recent years while many others have seen their incomes fall. Lastly, the “green economy,” Obama vowed, would create millions of jobs. The Energy Department has handed out $35.2 billion in stimulus money to jump start the clean energy industry, but it’s created more red ink than green jobs. Nationally, green technology accounts for just 2% of employment nationwide and there has been no marked boom in the industry. $90 billion also went toward subsidies for failed green energy companies like Solyndra and Ener1, and products like the Chevy Volt and Fisker Karma. In February, the non-partisan Congressional Budget Office (CBO) published its latest report on the “estimated impact” of the stimulus. In the second quarter of 2012, CBO estimated, somewhere between 200,000 to 1.2 million people had jobs they otherwise would not have were it not for the stimulus. Assuming, optimistically, that the number is 1.2 million, that means each of those jobs cost taxpayers $692,500. As time goes on, the maximum number of jobs sustained by Obama’s stimulus will decline rapidly. By the first quarter of 2013, it will sustain between 100,000 and 600,000 jobs, says the CBO. If it is 600,000, each of those jobs will have cost taxpayers $1,385,000. By the fourth quarter of 2013, the maximum number of jobs it sustains will be 400,000 — at a cost to taxpayers of $2,077,500 per job. Every fact checking organization from The Washington Post to PolitiFact has torn this one apart. Let’s recall three of the oft-repeated pledges upon which Obamacare was sold: 1. Lower premiums. False. 2. “If you like your plan, you can keep your plan.” False. 3. The law will bend the cost curve down by $2,500 for the typical family. For the second time since passage, false. A new government actuarial study finds that as a result of the law, health care spending will be $478 billion higher over the next decade than it would have otherwise been had no law been passed. Furthermore, as a result of the health care law, about 50 cents of every dollar of health care spending in the United States will be financed by the government by 2021 — according to the report from the actuary’s office at the Centers for Medicare and Medicaid Services. So in other words, one of every two dollars spent on American health care will be financed by the federal government thanks to Obamacare. Not to mention the CBO has also estimated that the bill will now will cost around $2.6 trillion over the next 10 years, $1.7 trillion more than Obama’s initial promise of $900 billion. Obamacare adviser and MIT economist Jonathan Gruber is also eating his words, going from insisting that the legislation would lower health insurance premiums to now admitting the law will significantly increase the cost of insurance 19-30% – especially for young Americans, who struggle most to find affordable health coverage. All it takes is a simple understanding of supply and demand economics. According to the Association of American Medical Colleges, the number of medical school students entering family medicine and primary care has fallen by more than 25%. Yet Obamacare is trying to add coverage for another 35 million people. In other words, at current graduation rates, the nation is facing a shortage of primary care doctors to cover these additional health care recipients, and what happens to consumer costs when supply goes down while demand goes up? Seriously? Every president who has inherited a recession in modern times has done better. Under Obama, measured on the basis of jobs, GDP growth, and incomes, Obama&apos;s has been by far the weakest recovery of the past 10 recessions. 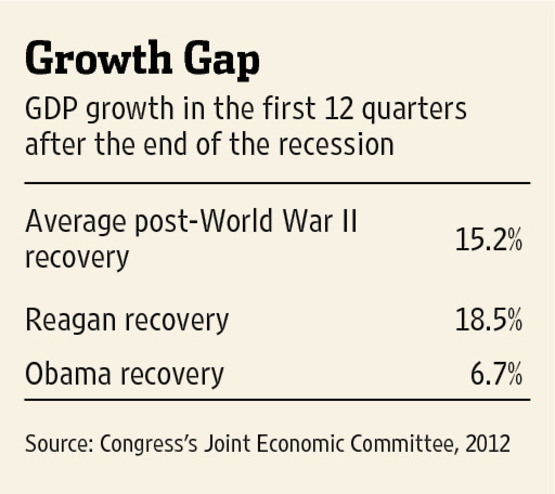 Since the recession ended, GDP growth has been 2.4% in 2010, 1.8% in 2011 and 1.7% in 2012 under Obama. The biggest difference between this recovery and others hasn’t been the nature of the crisis, but the nature of the policy prescriptions. Obama’s chief anti-recession idea was a near trillion-dollar leap of faith in the Keynesian “multiplier” effect of government spending. It was the same approach that didn’t work in the 1930s, didn’t work in the 1970s, and didn’t work in such other nations as Japan. It didn’t work again in 2009. Ronald Reagan also inherited an economy loaded with problems. The stock market had been flat for 12 years, inflation rates neared 14%, and mortgage rates almost 20%. The recession he endured in 1981-82 to cure inflation sent unemployment to 10.8%, higher than Obama’s peak of 10.1%. But the business and jobs recovery by early 1983 was rapid and lasted seven years. Reagan used tax cuts, disinflationary monetary policy and deregulation to reignite growth—the opposite of Obama’s policies.